One of the UK’s most acclaimed documentarians, Kim Longinotto has been working steadily since 1976, serving as her own DP the whole time. 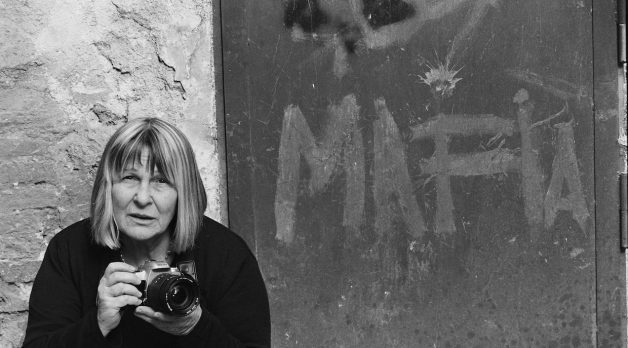 Unusually for Longinotto, who favors a direct cinema, observational approach, her latest is an archival-based film, examining the life and work of Italian photographer Letizia Battaglia, famed for her work documenting (at great risk) the Sicilian mafia. Via email, Longinotto discussed why she only uses one lens, what her all-time favorite lens is and the challenges of making an archival documentary look like an observational doc. Longinotto: I’ve been on camera in all of my films. I try to create a safe, quiet atmosphere for the people we’re filming. We work without talking among ourselves so that the contributor feels in control of the situation. The sound recordist and I have developed a choreography between us where we are super-aware of each other. We’ll move smoothly round each other and also adjust to suit each other’s needs. For example, if we’re filming in a noisy place, I’ll automatically go for a close shot so that the boom mike can come in very close. In a quiet situation, I’ll assume that I have more latitude and can enjoy having a wider shot. If we’re walking and filming together on a rocky terrain, I’ll rely on her to ensure that I don’t trip over something or fall down a hole. She will sometimes notice things on my blind side and may touch my arm to indicate I can pan right.